Many pet owners want to give as much love as possible to their animals, but not all of them are okay with their furry friends digging holes and taking patches out of their well-cared lawns. It’s not only the sight of bare soil and uneven grass that can make pet owners wince, but also with the idea of cleaning up animal poop and urine from their lawn. Thankfully, technological advancements in artificial grass have resolved these and many more problems posed by real grass. It’s not exactly a secret why pet owners are seeing artificial turf as a new and less stressful way of taking care of their four-legged companions. You love it when you see your pets frolicking around your lawn, though you hate seeing them too dirty and the natural grass in a state of perpetual mess. Instead of dealing with these problems, you can opt for artificial turf, which is made of safe synthetic materials. This means rain won’t make it muddy, while sunny weather won’t dry the soil enough to get your pet fur dirty. In other words, artificial grass gives your pets extra freedom to roam. Why let pets run around so freely? Animals, particularly dogs, need frequent exercise. Dogs are trained to work for many centuries, as they once hunted and scavenged for food, played with fellow dogs, and rigorously defended their territory. In short, they are genetically disposed to lead active and social lives. Once domesticated, dogs tend to get less physical activity and play, which often lead to behavioral problems, including destructive chewing and digging, hyperactivity, play biting, and attention-seeking behaviors like whining and barking. Exercise for dogs provides important health benefits. If they have lots of opportunity to run and have fun, or, in other words, exercise with recreation, they may eliminate problem behaviors of excessive barking and digging. Plus, regular exercise can decrease the risk of digestive problems, keep them agile and limber, and improve confidence and trust among timid dogs. Sometimes, pet owners dislike having their animals outside during rainy days because of the mess it can create in their lawn and beloved furry friends. However, artificial turf won’t get muddy at all. You don’t have to worry about pet paws and footprints damaging your grass, or your pets getting bedraggled by torn grass and mud. Furthermore, it’s hard to keep pets inside your house, especially when rainy days can last for weeks. If you have artificial turf in your lawn, your pets can still get out during a light rain shower and continue getting exercise throughout the rainy season. Artificial turf is likewise easy to clean. Modern artificial grass drainage technology now enables the easy hosing away of pet waste and liquid spills. Cleanliness is next to good pet health because a dirty environment can result in various dog diseases such as skin infection, diarrhea, and leptospirosis, among others. Artificial grass has received the stamp of approval from dog experts and pet hospitals. In fact, dog behaviorist Cesar Millan had artificial grass installed in his 10,000-feet Dog Center in California. Millan discovered that an artificial turf not only ensures cleanliness, but it also seems to deter digging behaviors. Pet hospitals are also getting artificial grass installed for their dog patients. 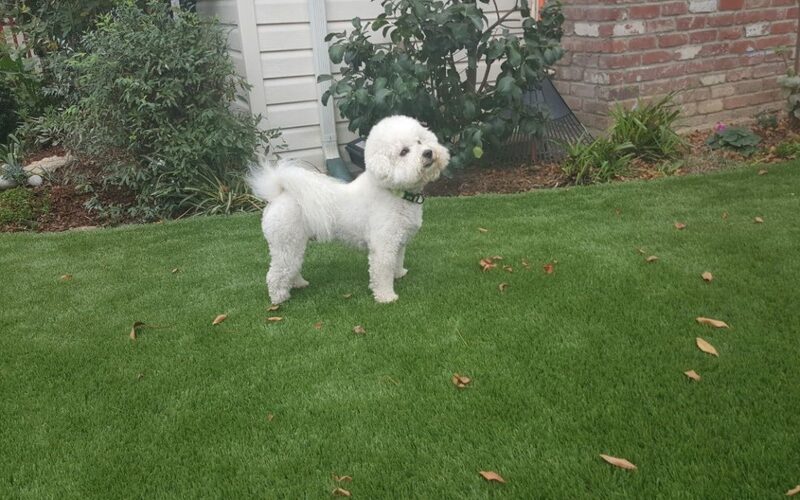 Veterinarians find artificial grass safe, easy to clean, and great for dogs to roam around and get sufficient exercise and recreation. An artificial turf offers important benefits for your pets: freedom to run and exercise including throughout the rainy season, cleanliness, and approval from dog experts and pet hospitals. Besides the convenience of a lawn that looks fresh and green all year round, artificial turf also makes the health of your pet its top priority. Seeing them active, sociable, and enjoying their lives playing on artificial turf would definitely make you a happy pet owner as well.